Lets review a couple of ideas that we discussed in the weekend report in our premium section. 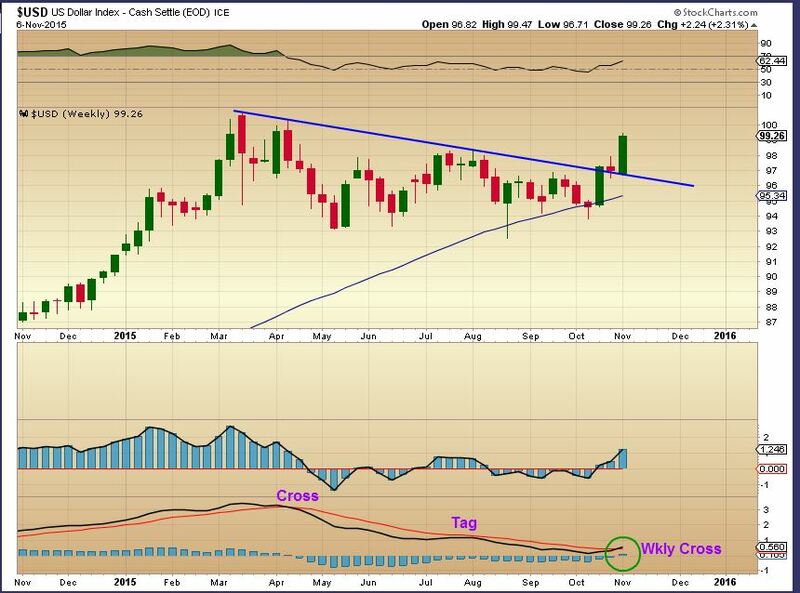 $USD – legitimate break out. 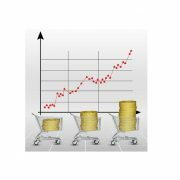 This could have major implications for Gold, Commodities, and the markets. 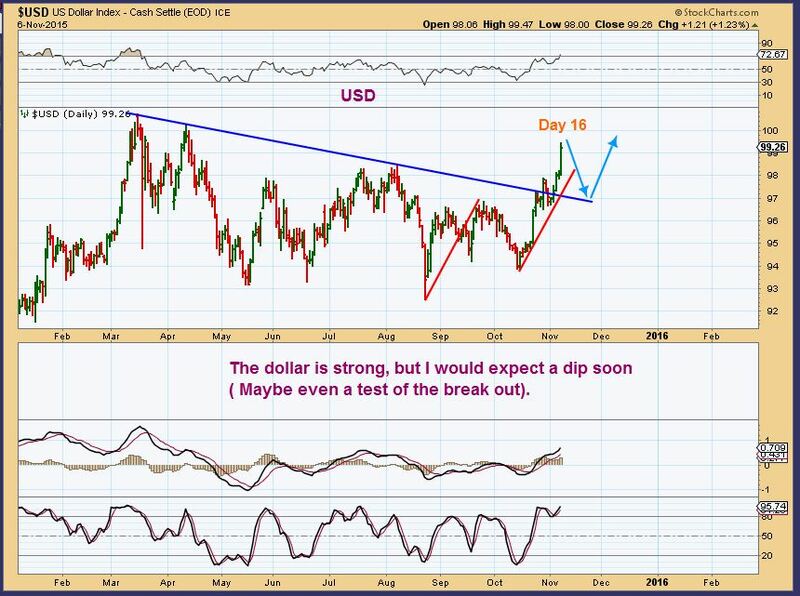 Cycle wise the Dollar has formed as right translated. On day 16 we should expect a small drop soon to a daily cycle low, and then another move higher. 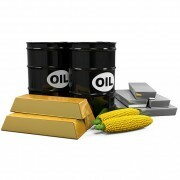 Keep in mind that with a strong dollar, we would expect commodities to have trouble. 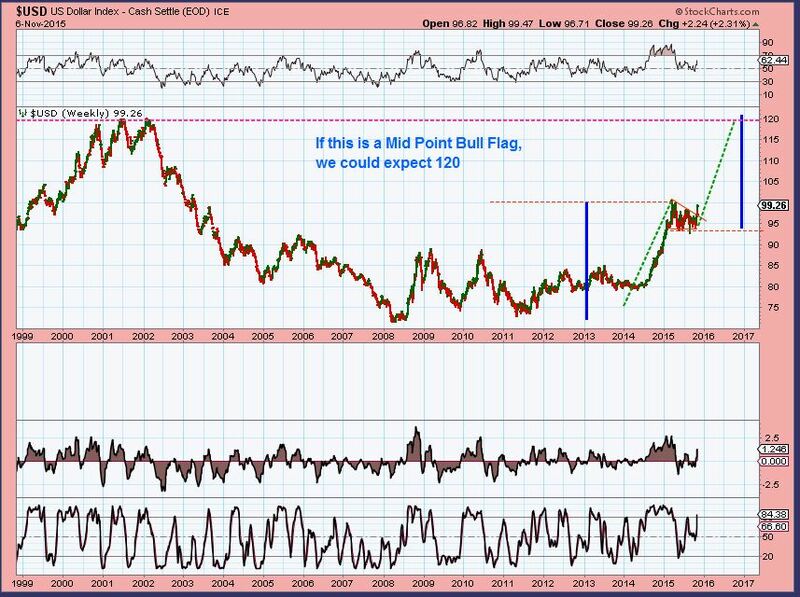 Big Picture View: We could get this measured move. Lets see if future FED intervention disrupts or endorses this pattern. At this point the CRB and OIL are not acting as weak as the dollar is strong. Gold on the other hand is dropping rapidly. Lets take a look. 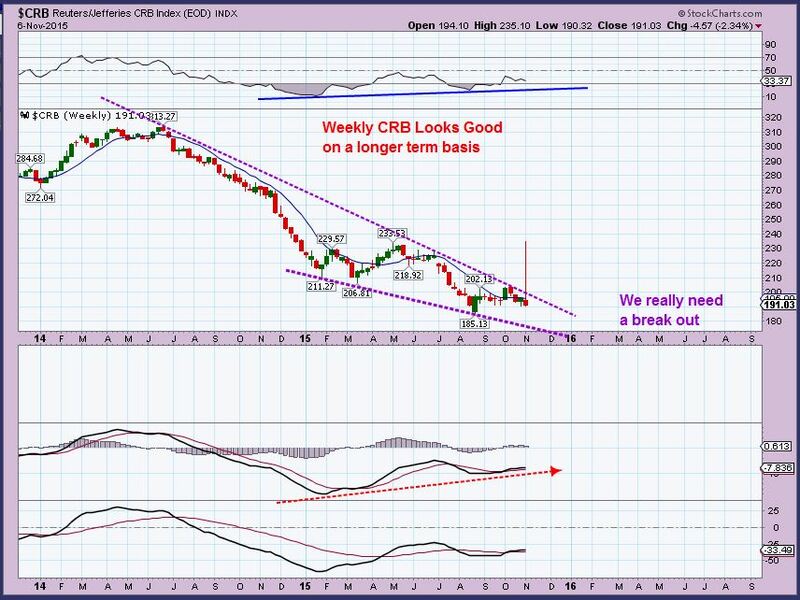 CRB – Longer term the CRB WEEKLY has strong bullish divergence . 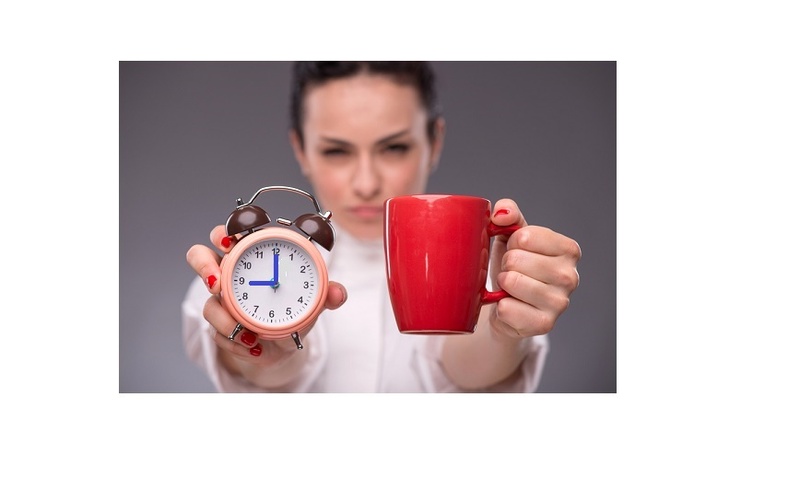 Keep in mind that on a weekly chart it can take Months to resolve in a truly bullish manner. A break out from this wedge is Bullish. 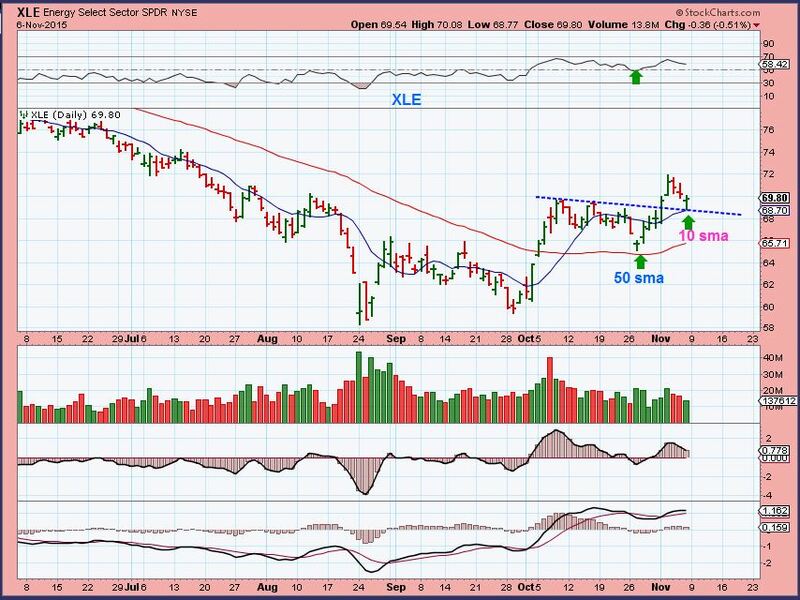 Oil looks both bullish and bearish, but the XLE has remained bullish at this point. 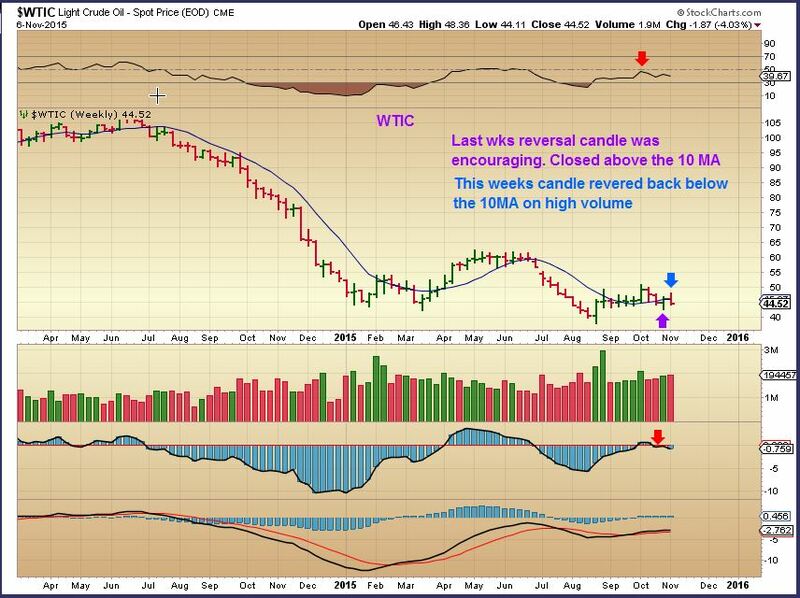 WTIC WEEKLY – Not so healthy looking with that wkly reversal. WTIC DAILY – The dollars big 3 day surge had 3 smallish days of selling here. Watch for trend line support. 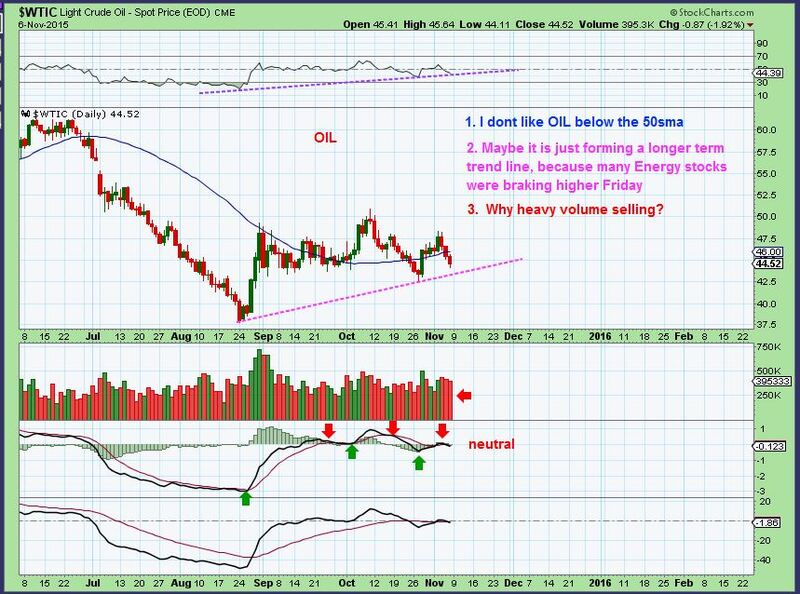 I have been focused on trading OIL/ ENERGY stocks, because the set ups look promising. Lets review. 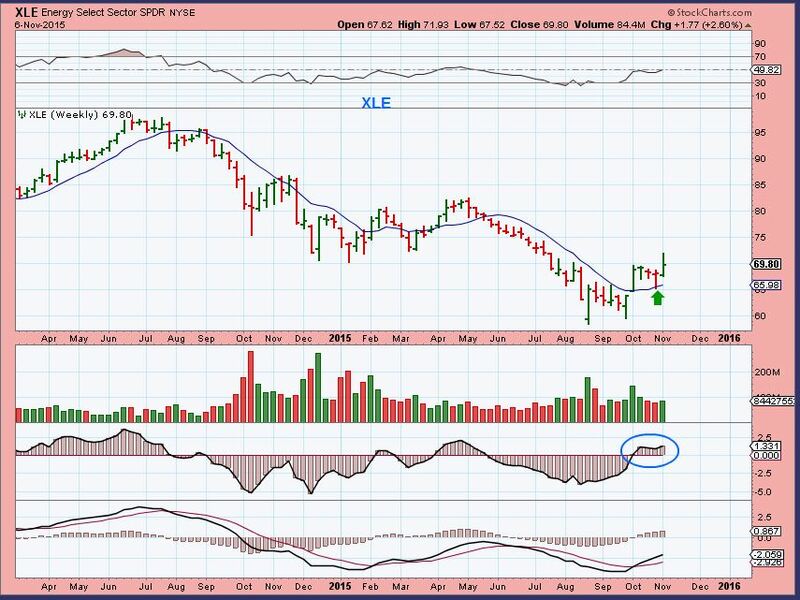 XLE WKLY – The XLE remained Bullish despite oils indecision. 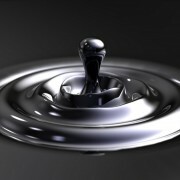 WITH OIL SELLING DOWN and the DOLLAR SURGING, This is what we see in some Energy & Oil stocks. 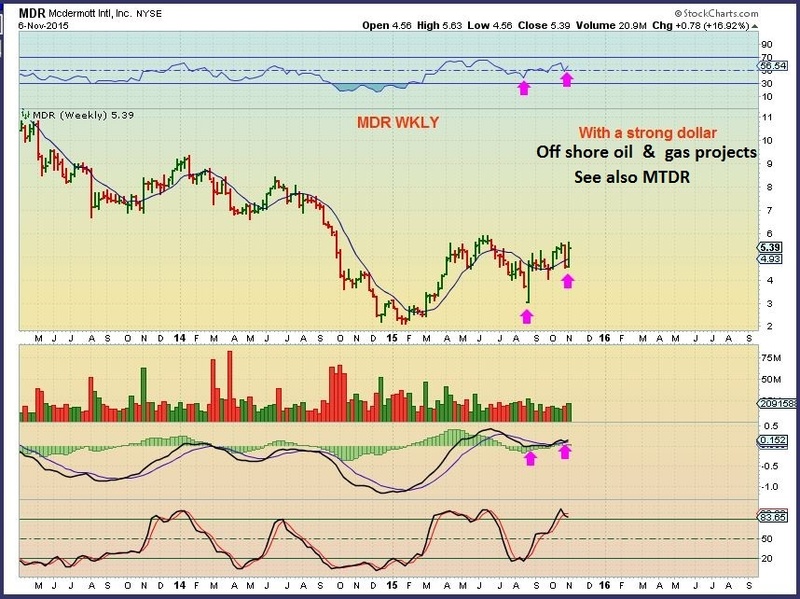 MDR & MTDR WKLY – A Bullish looking break higher last week. 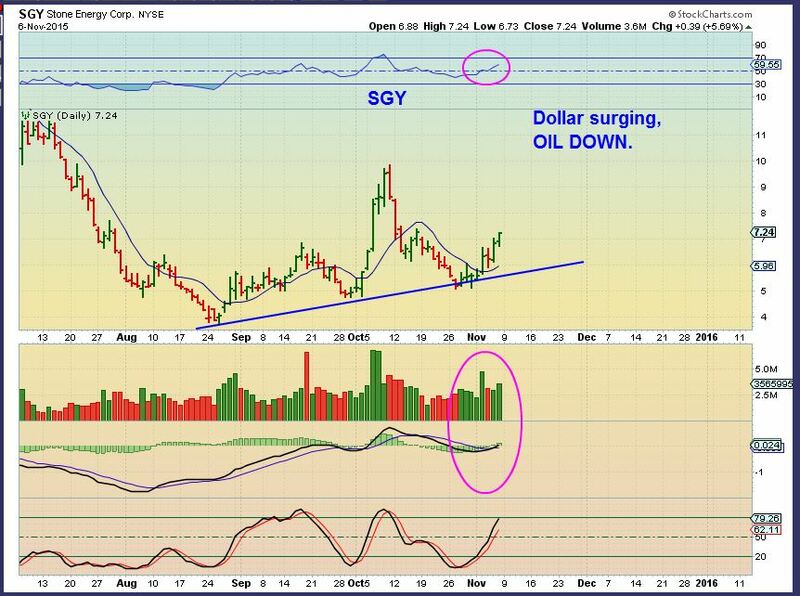 Notice these energy stocks are still acting bullishly with a strong dollar and oil selling off a bit. 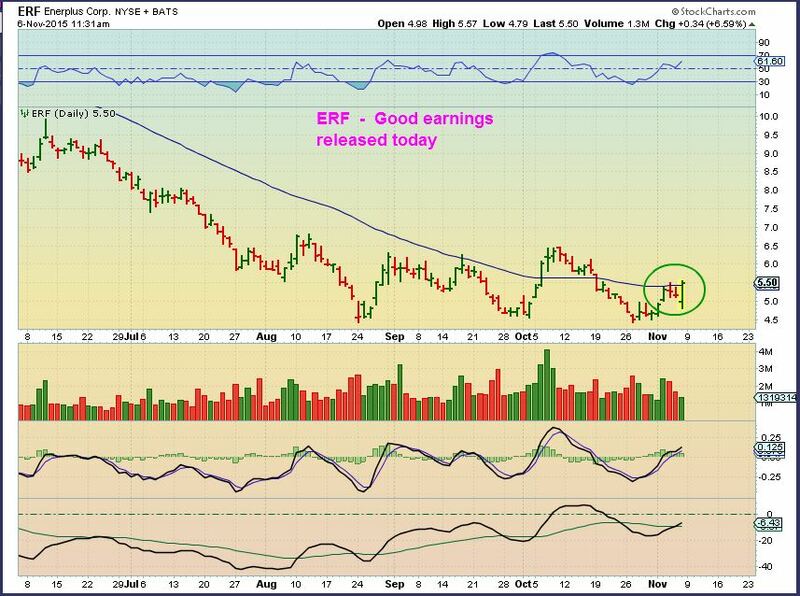 ERF – A Bullish set ups post earnings. See also EXXI, BAS, GST, SGY, RES, etc. 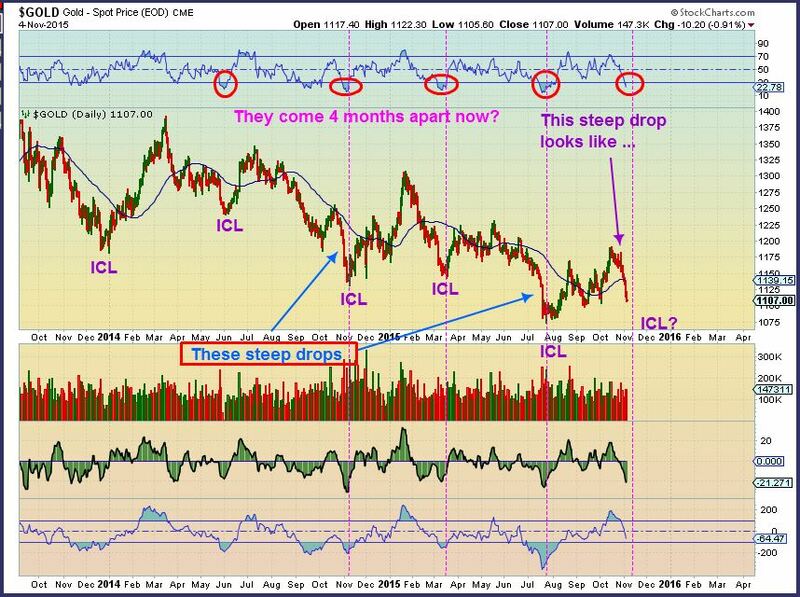 REMINDER: I pointed out that ICL’s ( Deep meaningful lows that rallies rise up from) used to come every 6 months, now they seem to be shortening to 4 months. NOV, MARCH, JULY, NOV. Mid Nov is 4 months from the Mid July ICL. 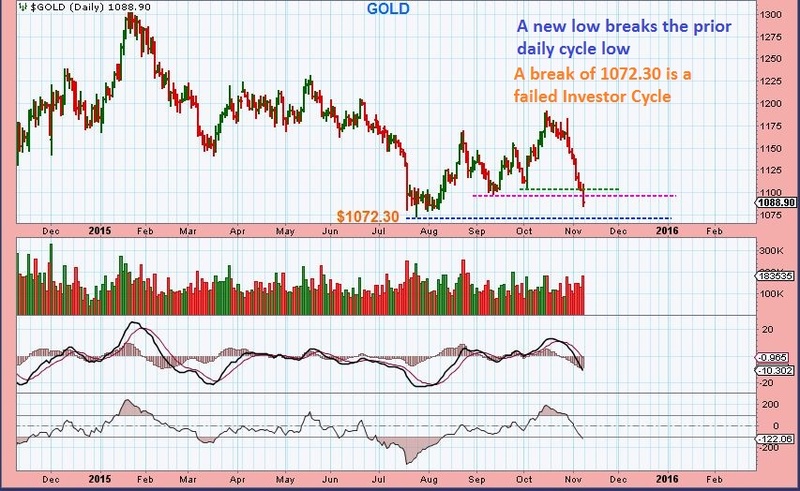 GOLD – Gold hasn’t broken the $1072.30 July lows at this point. 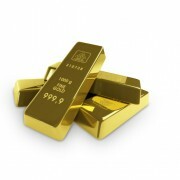 IF these lows hold and Gold can put in an ICL and move higher, we may see Higher lows and would look for Higher highs. 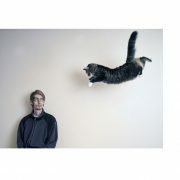 That could be the start of an uptrend. ( Patience is needed here to examine the clues going forward). 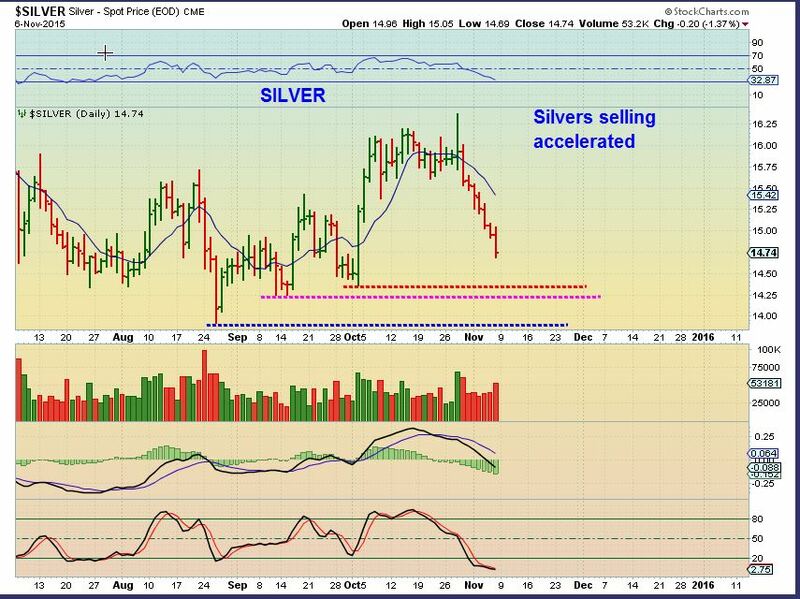 Note: SILVER & GDX have NOT even broken below the Daily Cycle lows as of the weekend. They often lead the way down & fall apart first, so this is interesting to see that they are a bit stronger lately. We do not want to see them break below the Aug lows. 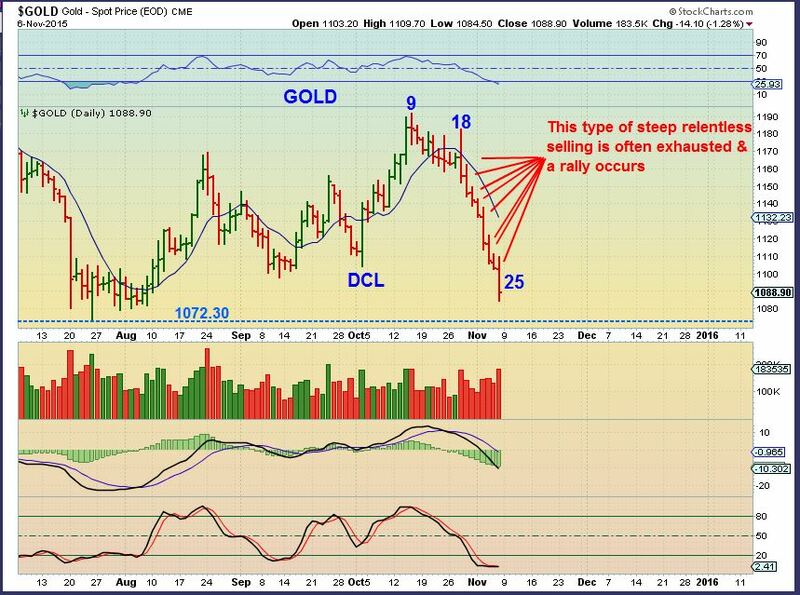 GOLD DAILY – This type of relentless selling day after day after day usually exhausts and should lead to a bounce/ rally soon. I’m watching for $1072.30 to hold. This review gives you an idea of some of the things that we are watching here at Chartfreak. The Dollar had a strong couple of weeks and the Markets have recovered from their summer sell off so far. 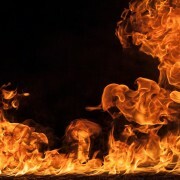 I expect a small pull back in the markets and will be watching how it handles the drop. 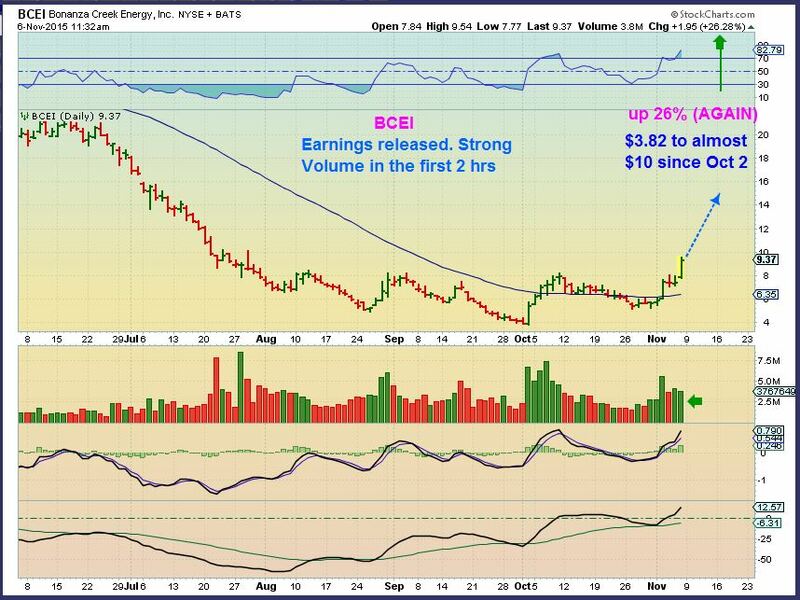 The beaten down Energy sector has been showing signs of life. While Oil has been basically going sideways, many Energy / Oil stocks have been popping higher after their earnings release. 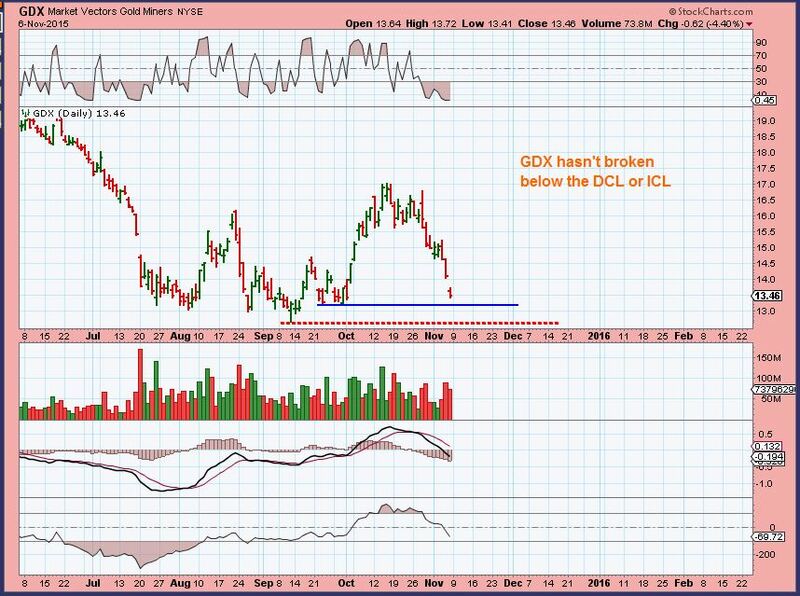 Gold, Silver, and Miners have been selling off and are on the watch-list for a potential bounce soon. I try to post here in the public section at least once a week, but if you think that following this type of analysis on a regular basis would benefit you in your trading, I also post 4 or 5 reports a week for only $37.95 / month in the premium section. Why not sign up and give it a try? 🙂 Please feel free to share a link of this page with your friends and Thanks for being here at Chartfreak! 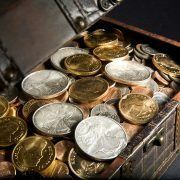 Precious Metals - "Oh My Precious"
Precious Metals - Alive Or Dead?